How to Recognize a Fake Job Offer - Something New Everyday! There are many fake job offers which job seekers get in their emails nowadays. While some can easily be distinguished as fake, others are not that easy. The below given list of points will help you to determine whether a job offer is genuine or fake. 1. The fake job offer email (referred to as email from here on) will tend to be boisterous and congratulate you in the subject line itself. 2. The domain names from which the email has been sent tends to be a bit shady. For example, let there be a company named ABC Inc. which is a genuine company. Now if ABC Inc. sends emails to job-seekers it will be from an @abc.com or @abc.org or @abc.net, etc email address. A reputed company will never use email services of Gmail or Yahoo Mail or Hotmail to send job offers to candidates (no matter how convincing it sounds, like abc_recruitment_drive@yahoo.com, it is fake). The candidate should exercise extreme caution while responding to such emails. 3. Usually, there is an attached file with the email (.doc/.docx/.pdf etc) which will bear the name "offer letter" or similar names. If you open the document you will see that it is very colorful, i.e. very bright font colors have been used along with pictures while writing the letter. A reputed company will generally never use such bright font colors while sending official emails for the purpose of recruitment. 5. If you are good in English you will see that the entire letter will be filled with grammatical errors and absurd meaningless sentences. No reputed company sends emails with such blatantly wrong English. They would never do so because that dampens the image and reputation of the company. 6. The email will often state that you have been considered for a very high post at some company which will be very surprising and definitely suggests that it is fake. Unless you have very high educational qualifications or have many years of job experience, you will not get an offer for a very high post at the start of your career. 7. We are often tempted to reply to the fake email sender and hurl abuses at him/her. It is human nature but it is advisable not to do so. If you reply to the sender, you are confirming that your email address is genuine and this will attract more spam and fake offers in future. If you get a job offer and you are convinced that it is fake, simply mark it as spam and delete it. The thumb rule of safe internet usage and safeguarding yourself against these criminals is "If it sounds too good to be true, it probably is." Remember this and use your common sense. 8. The job offer letter generally is an attachment in the form of an image. No reputed company will send job offers in the form of an image. 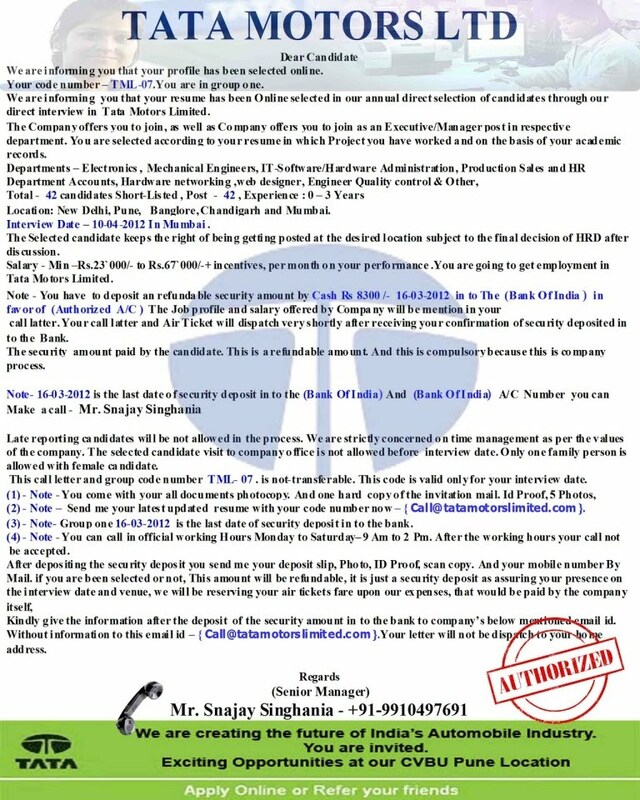 Below is a fake offer letter claiming to be from Tata Motors Ltd.